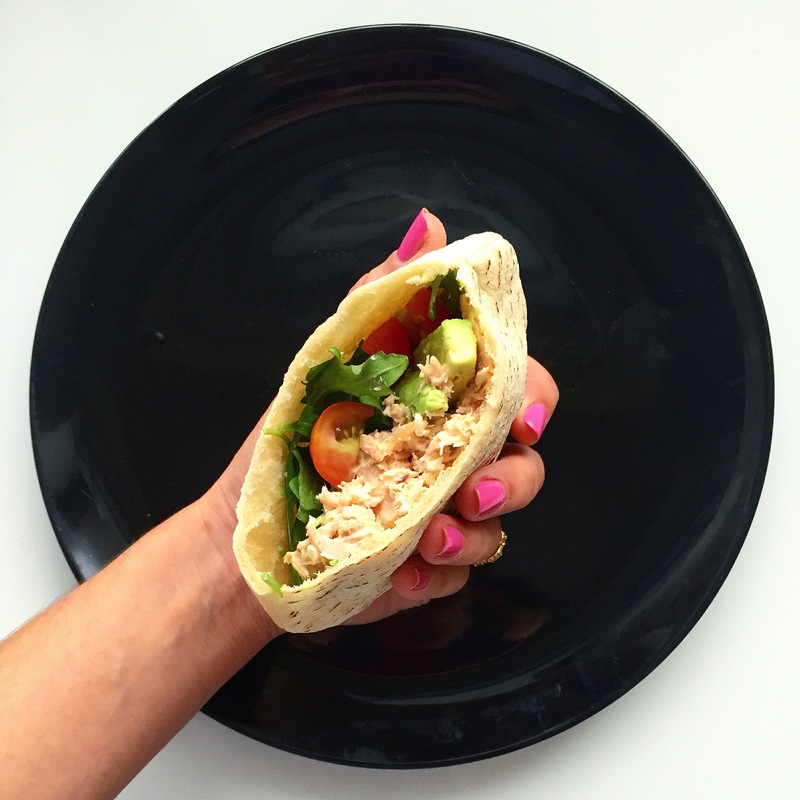 Light Lunch: Tuna and Arugula Pita Pockets – Pao Says, "Open Wide!" After a few week hiatus, I’m happy to report that I’m back in action. Being home in FL during my Christmas break was amazing, and I was able to make so many amazing dishes with my mom and family. As I get more down time from clinic, I’ll start posting some of those recipes. For now, I would like to share with you a quick, easy, healthy option for lunch! I have always heard people talk about how healthy tuna is and how easy it is (etc etc). However, to me, albacore tuna smells waaay to strong for me to even consider eating it… I have always stuck to a less cooked version of the fish (ahi, tartare, or sushi preparations). For those of you who are like me in their thoughts toward canned tuna, I have good news! Yellowfin tuna comes preserved in olive oil (as opposed to water), and its actually really good! It does have a bit of the fishy smell, but its nowhere near as aggressive as albacore tuna (canned in water) and it tastes pretty great! Give it a try sometime, and enjoy this healthy and delicious meal 🙂 This recipe serves two, so you can make the tuna mixture ahead and have a great lunch packed for 2 days! 1/2 celery stalk (finely chopped)… if I find myself without celery, I use a pinch of celery seed. Open the can of tuna and drain out *most* of the olive oil. I like to leave a bit in it to incorporate a little olive oil into the tuna salad mixture. Place the tuna in a bowl and break it apart with a fork. Squeeze some lemon over the tuna and sprinkle some salt over it. Add the chopped onions (should be about a tbsp- a tbsp and a half), and the mayo and mix well. Time to assemble your pitas! Split the pitas and spread the tuna mix onto one side. Add some arugula and tomatoes. Close the pita and enjoy your lunch!